The foundation of Kuha‘o Zane is hula. This traditional Hawaiian dance is the cornerstone of his personal and professional life. Martial arts have dojos where practitioners train in a particular kind of combat. In the same vein, hula has a halau where they practice a certain style of dance. Kuha‘o is a member of Halau o Kekuhi. There are two categories of hula: kahiko (ancient) and auwana (modern). Kuha‘o and his family practice a style of kahiko called aiha’a, which literally means to be low to the ground. Hula has a profound impact on Kuha‘o’s work as a designer. His mother taught the halau how to make their costumes for performances through traditional mediums like ‘ohe kapala (bamboo print making). 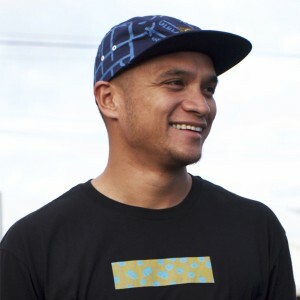 This organic artistry had a profound affect on KZ’s work as a designer because it allowed him to weave together indigenous Hawaiian concepts into modern, street wear fashion pieces like an Aloha shirt, Vans or a New Era hat.